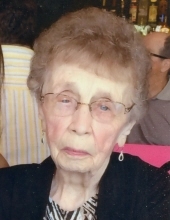 97, of Mussey Township, died Tuesday, February 5, 2019, at The Pines of Lapeer, Assistant Living. She was born in Imlay City, on August 6, 1921, the daughter of the late Edward and Emma Lubahn. Her marriage of 43 years to Jack D. Beischer was November 6, 1948. Jack died on June 14, 1991. Thelma was employed by Snap-On Inc., Detroit, MI before raising her family and was an avid member of St. John’s Lutheran Church, Capac. Surviving are a daughter, Debra Hlubic of Capac and a son, Dale Beischer of Oscoda; two granddaughters, Jennifer (David) Pickelhaupt and Katie Hlubic; two great-grandchildren as well as several nieces, nephews, and friends. She is preceded in death by her two siblings, Edward Lubahn, Jr. and Shirley Bartlet. The family honors the memory of Thelma and invites you to visit and share memories Thursday, February 7, 2019, from 2:00 to 8:00 p.m. at Kaatz Funeral Directors, Capac. Funeral services will be 11:00 a.m. Friday with 10:00 a.m. visiting. Rev. Charlie Martin, pastor of St. John’s Lutheran Church, Capac, will officiate. Memorials are suggested to "Wishes of the Family". To send flowers or a remembrance gift to the family of Thelma Louise Beischer, please visit our Tribute Store. "Email Address" would like to share the life celebration of Thelma Louise Beischer. Click on the "link" to go to share a favorite memory or leave a condolence message for the family.